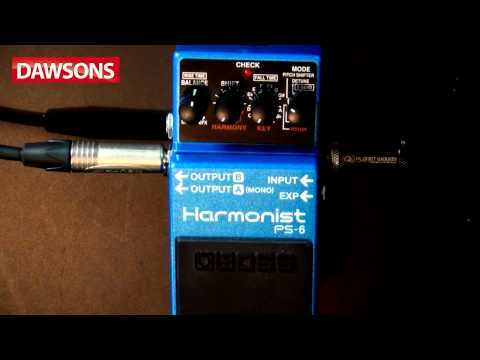 The Boss PS-6 Harmonist Guitar Effects Pedal offers two & three-voice harmonies (saving you money on additional guitarists) and Harmony, Pitch Shifter, Detune & Super Bend pitch-shift effects. What’s more you can hook up an Expression pedal for real time pitch manipulation. In comparison to previous models the Boss PS6 Harmonist Guitar Effects Pedal has seen a vast improvement in sound quality to keep harmonies tight and natural sounding. Creating a three-voice Harmony is simple with the Boss Harmonist PS-6: just choose a minor or major key & set the Shift knob to 3-Voice and you’re sorted. Alternatively you can create two or three voices and put them through Detune or Pitch Shifter modes. Widening your sound Detune can output your dry signal and an additional two voices; one with a slightly higher pitch, one with a lowered pitch. For arpeggio-style playing you can create additional voices, with one an octave above the original signal and another a fifth below the note you’re playing. New to the Boss PS 6 Harmonist Effects Pedal, Super Bend is every bit as good as it sounds; allowing you to bend the pitch of your sound across a span of seven octaves, from –3 to +4 octaves. This effect can be controlled either with the onboard control or with an external Expression pedal (sold separately).